Some moles, initially benign, can sometimes change and develop to become malignant and must be removed. During regular dermatology consultations that have taken place from an early age, the dermatologist will ask for the preventive removal of certain beauty spots. Some perfectly benign tumours may need to be removed, however, either due to their unsightly appearance or because of discomfort from friction and irritation in certain areas (on the belt, the bra, the neck, etc.). Because of the severity of malignant tumours such as melanomas, it is very important to see a dermatologist regularly. However, a simple visual examination by the dermatologist does not always allow them to confirm whether a tumour is benign or malignant and a biopsy may be needed in case of doubt. In fact, only a microscope examination (anatomopathological examination) can confirm the diagnosis. A surgical biopsy will need to vary in size, depending on the case. Malignant tumours (skin cancer): epitheliomas, melanomas, sarcomas. Removal is necessary. To achieve complete healing, it is necessary to remove them completely by removing areas to the sides and deep down (ensuring a safety margin) to prevent them from recurring or spreading locally or remotely (metastases). Among these malignant tumours, the most frequent are basal cell epitheliomas. These usually develop in people with pale skin who have been exposed to the sun a lot, including in their youth; this is why they affect the face and neck in more than 95% of cases. Their growth is only localised and they do metastasise in the body, therefore do not call for a critical prognosis. They can, however, develop quite aggressively in local areas, which can lead to significant disfigurement, especially around the eyes, nose, mouth, or ears. During preoperative consultations with a dermatologist, it is important to carry out a diagnosis to determine if a small excision should be made for a lesion that is likely to be benign or if a broad excision is needed for a malignant lesion. In case of doubt, a biopsy (partial sample) may be taken in the doctor’s office for microscopic examination to determine the exact nature of the lesion. I will then give you all the information on the techniques I propose along with information sheets from the Société Française de Chirurgie Plastique Reconstructrice et Esthétique (French Society of Plastic, Reconstructive and Cosmetic Surgery) as well as a detailed estimate of the costs according to the options chosen. No examination is usually necessary, unless you are having a general anaesthetic (possible blood test). If you are having a general anaesthetic, you will need a consultation with the anaesthetist in the weeks before the operation and at least 48 hours beforehand. If you have a general anaesthetic, you will need to strictly fast for 6 hours before the operation (do not eat anything, chew gum or candy or smoke). For a local anaesthetic, however, it is recommended that you drink and eat lightly at normal mealtimes. Tobacco consumption should be stopped or reduced to a minimum during the month before and month after the intervention. Tobacco can cause scarring problems. The procedure can be carried out in the doctor's office or in the clinic. If you need to stay in hospital, this is usually limited to half a day in a day hospital. For elderly people with extensive tumours, one night in hospital is sometimes necessary. Before the procedure, I will go over the precise goals with you that we agreed during the consultations. You can then always make recommendations and ask any questions. I will then draw the marks on your skin to guide the operation. For small excisions, stitches will normally be made to leave a linear scar. For larger excisions, either a neighbouring skin flap or a skin graft taken from elsewhere can be used to cover the excision area. The sutures are very fine absorbable ones which do not require shrinkage. In all cases, the technique chosen should give maximum safety to the excision to avoid recurrence while preserving the function and aesthetics of the structures adjacent to the tumour, in particular for the eyes, nose, mouth and ears. All tumours that are clearly benign and do not require histological examination can be treated by a laser. It vaporises the skin lesion without damaging the skin around it, leaving practically no mark with a superficial lesion (pigmentary spots due to ageing and the sun, angiomas, couperose, keratoses, ...). The pain is very moderate and, most of the time, there is no need to take pain killers. You will usually have swelling (oedema) and sometimes bruising, which varies from case to case and takes a few days to disappear almost completely. You can mask this with a suitable make-up designed for post-operative use the day after the operation. The stitches used are absorbable and do not need to be removed. You will need to make a follow-up visit a week after the procedure. Exposure to the sun: no direct exposure before a month and a half, then exposure is possible using a sun protection cream with a maximum protection factor. Make-up: the bruises can be hidden by a cover-up cream the day after the operation and your usual make-up can be applied on top. The products used must be adapted and designed for post-operative use. They will be prescribed to you on a post-operative prescription. The healing process varies according to your skin type. The scar may remain pink for several weeks or months. When it has completely whitened, it is usually very discreet. 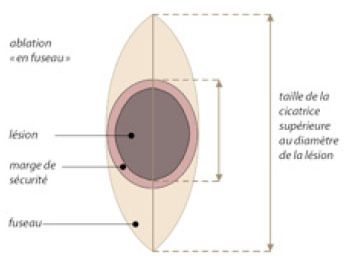 The technique chosen gives maximum safety to the excision to avoid recurrences while preserving the function and aesthetics of the elements adjacent to the tumour as much as possible, in particular, for the eyes, nose, mouth and ears. The removal of skin lesions is covered by Social Security and, if necessary, by your mutual insurance company. A detailed estimate is given to you during the first consultation according to the options chosen.